This classic cookie gets fancied up for the holiday season with tart cranberries, toasted walnuts, and a generous coating of chocolate. Preheat the oven to 325 degrees Fahrenheit. Line 2 cookie sheets with parchment paper and set aside. In the bowl of a stand mixer fitted with the paddle attachment, combine the butter and sugar and beat until smooth. Beat in the eggs. In a large mixing bowl, whisk together the flour, baking powder and salt. Add the dry ingredients to the butter mixture and beat on low until combined. Add the nuts and cranberries. Roll the dough into six 10-by-1 ½-inch logs. Arrange the logs on the prepared baking sheets and bake until golden, about 30 minutes. Remove from oven and let cool 15 minutes. With a serrated knife, slice the logs on the diagonal, about 2/3-inch thick. Bake the slices, cut side up, for an additional 18 minutes, or until lightly browned. Let cool. Melt chocolate and coconut oil together in the top of a double boiler until smooth. One at a time, dip one end of the biscotti into the chocolate mixture. 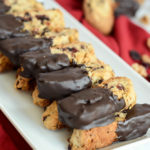 Place dipped biscotti on a baking rack over a large piece of parchment paper (to catch drips.) Let chocolate set and transfer biscotti to a resealable container or bag. Store in the refrigerator or freezer.